ROSA KHUTOR, Russia – Austrian veteran Mario Matt threw down a clutch second run at a most opportune moment, on an extremely tough course (more on that later), and captured the gold medal in men’s slalom on Saturday night, the final alpine event of the Sochi Winter Olympic Games. Matt, twice a gold medalist at the World Championships (in Are in 2007 and St. Anton in 2001), had never before won a medal at the Olympics. He stood in the start with his teammate, Marcel Hirscher, in first place. Under the lights at the Rosa Khutor Alpine Center, Matt had 1.28 seconds to spare, his lead over Hirscher after the first run. And he gave almost all of it back, losing time, particularly on the difficult bottom pitch. But he had just enough cushion to wind up with the gold medal, by 0.28 seconds. His two-run time was 1:41.84, to 1:42.12 for Hirscher. In third behind the two Austrians was Henrik Kristofferson of Norway, who finished the first run in 15th place, but had a brave second run to claim the bronze medal, in 1:42.67. The medals for Matt and Hirscher gave Austria four in the past two nights; Austria’s Marlies Schild and Kathrin Zettel finished second and third behind Mikaela Shiffrin in the women’s slalom on Friday. Austria ended the Games with nine medals in alpine skiing, three gold, four silver and two bronze. The U.S. was the runner-up in the alpine medal count, with five, two gold, a silver and two bronze. As it happened, the second run featured another devilish Ante Kostelic course set – the Croatian coach whose son, Ivica, was in the mix Saturday night. Ante Kostelic caught some flak for a tough slalom set in the men’s super combined. And this slalom course caught quite a few skiers, including the U.S. team’s Ted Ligety, who was within range of the leaders after the first run, in sixth place, just 0.86 seconds out. But he skied out halfway down the course. And afterwards, he had quite a bit to say about the quality of the set. While acknowledging that the course set was within the rules, Ligety said, “I think it draws an ethical question when you have a dad setting for a son — not that Ivica ever does well when his dad sets — but this is an Olympics. We’re trying to showcase our sport to the rest of the world, and I don’t think this does us any favors, especially when you have 12 guys in the top 30 go out. [10 DNFs, two DSQs] That’s not the ideal setting for that kind of stuff, especially when the snow is bad. Ligety, however, was not the only one criticizing the course set. Alexis Pinturault of France, one of the top slalom skiers in the world, was given the bum’s rush by Ante Kostelic courses twice in these Olympics, in the combined slalom, and Saturday night. View more photos from this race in our gallery here. Men’s Olympic slalom, Sochi, Russia, Feb. 22, 2014. … It is the tenth and final alpine event of the 22nd Winter Olympics at the Rosa Khutor facility. … It is the 36th Olympic slalom, the 18th for men. … Austrians have won seven, Germany three, Canada one, Croatia one, France four, Italy four, Liechtenstein one, Norway two, Spain one, Switzerland three, Sweden two, U.S. five. It is 45 degrees Fahrenheit at the start and 50 at the bottom for first run. It is a night race and there are 117 starters. It is the second Olympic result for Mario Matt, the first medal and his first finish in slalom. … It is his second win and third podium of the season, all in slalom. 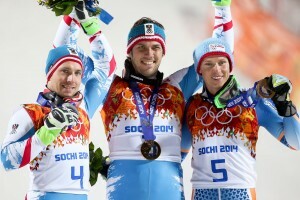 … It is the 34th Olympic gold medal for Austria… the ninth alpine medal and third gold of these Games. It is the first Olympic medal for Marcel Hirscher who had finished fourth in two Olympic GS’s. … It is his 13th podium result of the season. It is the first Olympic medal for Henrik Kristoffersen. … It is his fifth podium result of the season. … He is the 17th Norwegian to earn an alpine Olympic medal. It is the best of two Olympic results for Nolan Kasper. … He was 24th in slalom in 2010. 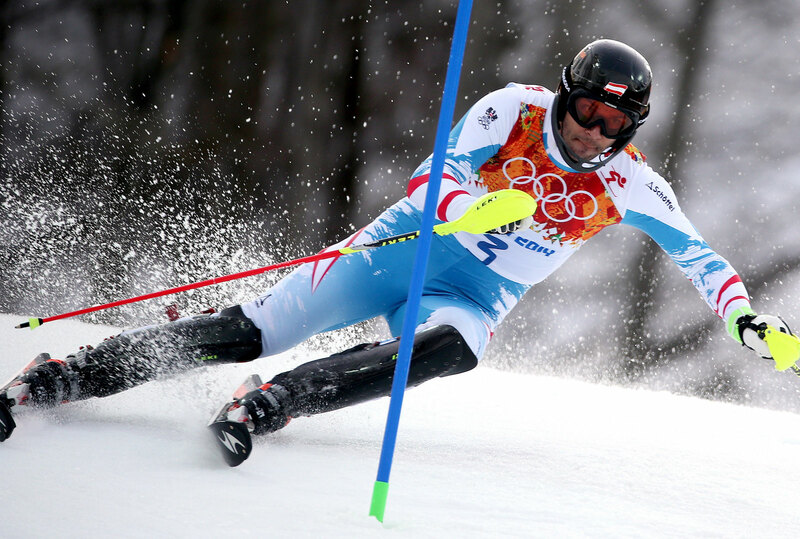 … It is the second best Olympic result for Michael Janyk after a 13th in slalom in 2010. … It is a career-best Olympic finish for Philip Brown. Final alpine medal count: Austria 3 gold, 4 silver, 2 bronze; Canada 1 bronze; Croatia 1 silver; France 1 silver, 1 bronze; Germany 1 gold, 1 silver, 1 bronze; Italy 1 silver, 1 bronze; Norway 1 gold, 2 bronze; Slovenia 2 gold; Switzerland 2 gold, 1 bronze; U.S. 2 gold, 1 silver, 2 bronze. Russia becomes fourth home team to lead in medal count; appeal over French suits in ski cross dismissed. It's the first-ever Olympic medal sweep for Norwegian women; Austria gets its first gold in snowboarding.